Unless what you’re building is so small, so tight, so single purpose, it seems like every product accumulates some extras that just need to go somewhere. The corners of the screen (when a bunch of unrelated things pile up in a corner I call it a dark corner). Behind menus (when a bunch of unrelated things pile up in a menu I call it a junk drawer). Check out the tools you use — or you made. Look in the corners. You’ll find some odd decisions. Why are those things together? Why is that there? What does that have to do with that? The top right dark corner on Medium. You’ve got: Share, publish (with a pulldown), a “…” (which expands into 6 options), a vertical divider, then a bell then your avatar (which expands into 8 options). I’m not suggesting there was a better place to put these controls. I’m only saying that it’s a dark corner. A bunch of stuff piled together. Not really related other than it needs to go somewhere and that somewhere happens to be the top right corner. Corners tend to be convenient places for things to hug the edges, as far out of the way of the interface as possible without being off the screen or in your face. Apple’s products are full of dark corners. From that corner you can favorite, get metadata (and assign a location), create a slideshow, text the picture to someone, or edit it (crop, enhance, rotate, etc). One button is spelled out, the others are iconographic. Once you understand how it works it’s fine, but mostly it’s just a place to put some stuff that needed to go somewhere. Again, not necessarily bad, just how it is. What you’ll often find in (dark) corners are junk drawers. Junk drawers are menus that, like dark corners, have options that don’t really seem to be related. The stuff in the menu just needed to go somewhere. Top right menu in Basecamp 3. When you click your avatar you’ll find a menu with your notification settings (my Work Can Wait schedule is on, so that’s why you see the explanation about why my notifications are off), your to-do assignments, to-dos you’ve assigned other people, saved drafts of unpublished posts, a link to the ‘what have I been up to?’ report, a link to the ‘Who clapped for me?’ report, a link to update your personal information, and a link to sign out. Yeah, kinda sorta loosely related since it’s all about me behind my avatar, but really not quite as cohesive as it should be. It’s a bit of a junk drawer. Top left menu in Basecamp 3. This menu is kinda crazy. When you click the Happy Camper (Basecamp icon), a menu comes down. At the top we have a link to “Adminland” which is where all the admin controls are for your account. Then we have the latest news and updates about the product. 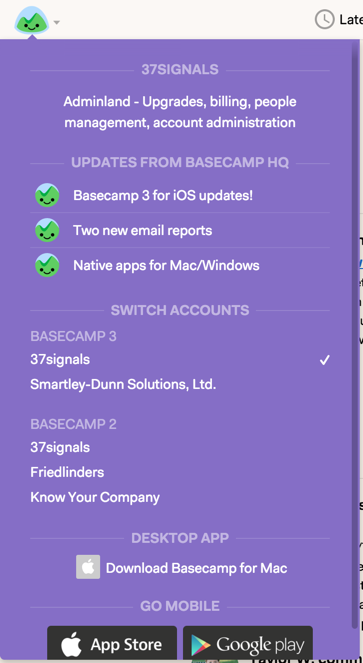 Then a list of your other Basecamp accounts (3, 2, and 1, aka Classic), then a link to the desktop app for the platform you’re on (Mac or Windows), and then links to the mobile apps for iOS and Android. And now let me catch my breath. Can you say junk drawer? I can. Am I thrilled about it? No. Is it a huge deal? No. Is it a drop everything and fix it now kind of annoyance? No. Can we improve it later? Yes. Should we improve it later? Yes. I hope we can all laugh at our own work sometimes. Dark corners and junk drawers accumulate over time. The more mature the product the darker the corners and the messier the drawers. Sometimes it’s not worth doing anything about them — they are what they are. They certainly aren’t the end of the world, but they’re still good to pay attention to and clean out from time to time. The worst part about them is that they seem to be magnetic. Once you’ve got a junk drawer, it’s easy to put more junk in the drawer. That’s the biggest risk. Once you’ve got dark corners, it’s easy to push more stuff into them. Who’s going to notice just one more thing up there? You know how it goes. So check your apps. The ones you make and the ones you use. See any dark corners? Find any junk drawers? They aren’t necessarily bad, and they may even be the best reasonable solution, but being aware of them is generally a good idea. And maybe it’s time for spring cleaning. 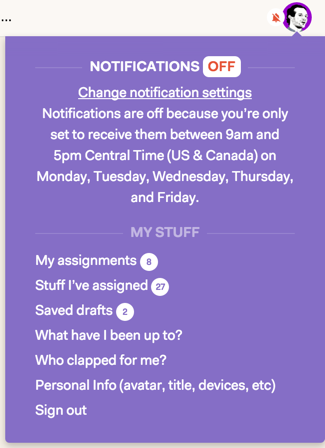 Now that I’ve highlighted two slightly embarrassing menus in Basecamp 3, I hope you’ll come and check out all the amazing good stuff. I thoroughly believe that Basecamp 3 can make your company a better place to work. I’m happy to take the time to show you how. Just email me and I’ll give you a personal tour.